www.TheCombatSystem.com www.Youtube.com/DanTheWolfman1 - Dan "The Wolfman" Theodore has been training in many different martial arts since 1986 and has been training with many of the best MMA fighters and grappling instructors around the world since 1997 including Dan Severn, Team Punishment, Tank Abbott, MFS, Saulo Ribeiro, Eddie Bravo, Gokor Chivichyan/Gene LeBell, and 3 months at Black House. Dan's advanced instructional videos on MMA, Combatives Self-Defense, Systema Applications, Catch Wrestling, and overall Grappling have gotten over 6 million views and counting. Dan has fought in MMA against the likes of UFC no.1 contenders Pancrase Champion Yuki Kondo and Jeremy Horn. and won 3 fights by first round submission. He's had two Kudo World Championships fights and a 1 Hour long 85% real Underground fight at Takada Dojo in Japan for the Pride President without knowing what was really going on or for how long! Also, many Advanced No Gi Grappling wins, most by submission, and 2 Gi BJJ wins. Currently Dan works in the Entertainment Industry as a Stuntman/Actor/Motion Capture Performer and has been involved with such projects as CSI: NY, Chuck, Sons of Anarchy, Real Steel, Couples Retreat and Metal Gear Rising. MMA DVD Packages are available on his website! ProMMAnow.com reporter Daniel Theodore caught up with TUF 17 winner Kelvin Gastelum this past week at RFA 9 where he was there supporting his Ultimate Fighter teammate Kevin Casey. Gastelum talked about his upcoming fight with Brian Melancon which takes place Wednesday, Aug. 28, at UFC Fight Night 27 LIVE on FOX Sports 1. Muay Thai champion-turned-pro WMMA fighter Justine Kish (2-0) talks with ProMMAnow.com’s Daniel Theodore following her second round submission win (arm bar) over Christine Stanley (1-1) at RFA 9. Hello everyone, I hope you enjoyed Part 1 of Wolfman Breakdown of Cub Swanson vs Dustin Poirier and the use of Calf Kicks! 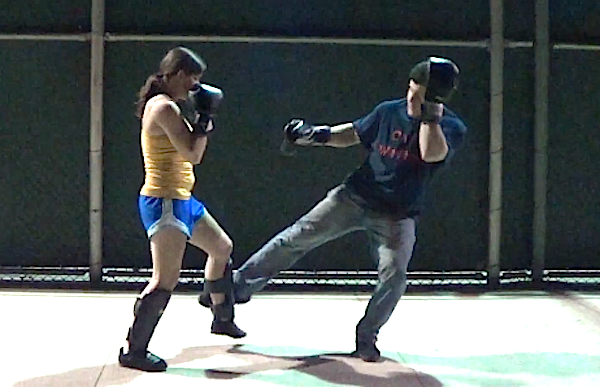 Now in Part 2 we not only will be looking at the benefits here of being familiar with these kicks, but also look at the benefits of the two fake punch to kick attacks that Cub Swanson used in the fight with videos on how to do them. Hello everyone, this is a Wolfman Breakdown on the use of Super Low Calf Sweep Kicks prompted by their use by both Cub Swanson and Dustin Poirer in their fight this past weekend at UFC on Fuel TV 7! “Judo” Gene LeBell talks about how he came to ref the Muhammed Ali vs. Antonio Inoki match, BJJ vs. catch-wrestling, and his thoughts on Steven Seagal and the alleged choking incident. 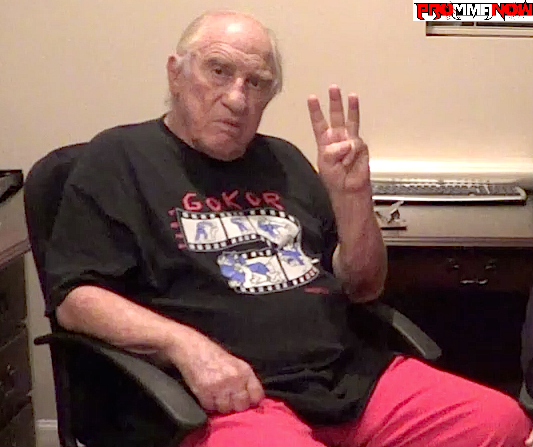 “Judo” Gene LeBell talks about working in the movie industry with such superstars as Elvis Presley and Bruce Lee. He also discusses his mentoring relationship with Ronda Rousey. ProMMAnow.com reporter Daniel Theodore recently sat down with the legendary “Judo” Gene LeBell to discuss his colorful life and influence on the world of grappling and mixed martial arts. Bellator season six featherweight tournament winner Daniel Straus (20-4) was scheduled to fight the winner of Pat Curran vs. Patricio “Pitbull” Friere for the Bellator 145-pound title but Curran suffered an injury, so Straus is currently sidelined without an opponent and without a fight. ProMMAnow.com talked with Straus about the situation. ProMMAnow.com caught up with Strikeforce lightweight Matt Ricehouse following his loss to Bobby “King” Green at “Strikeforce: Rousey vs. Kaufman”. Ricehouse gave his thoughts on the decision, taking the bout on short notice and where he goes from here. ProMMAnow.com talks with Team Quest welterweight Tarec “The Sponge” Saffiedine about his unanimous decision win over Roger Bowling at “Strikeforce: Rousey vs. Kaufman” on Saturday and his desire to fight UFC vet and current Strikeforce 170-pound champ Nate Marquardt for the title next.